The night before, pour sugar into an medium sized bowl. Open the vanilla bean with a knife, scraping the seeds into the bowl. Mix the vanilla beans with the sugar, cover the bowl and let stand overnight. The next day, grind the chocolate in a food processor. Add the chocolate into the bowl with the sugar and vanilla beans, mix. In a large saucepan, heat the milk until it boils. Add the chocolate, sugar and vanilla mix and beat with a molinillo or a blender until frothy. Add marshmallows if desired. 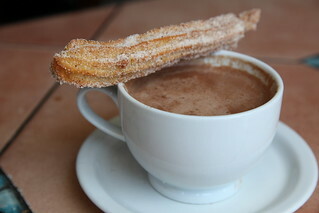 Mexican hot chocolate is usually paired with churros. Serve warm! Provecho.